Whoever has My commands and keeps them is the one who loves Me, and the one who loves Me will be loved by My Father, and I will love him and reveal Myself to him. Remember the movie in the picture above? 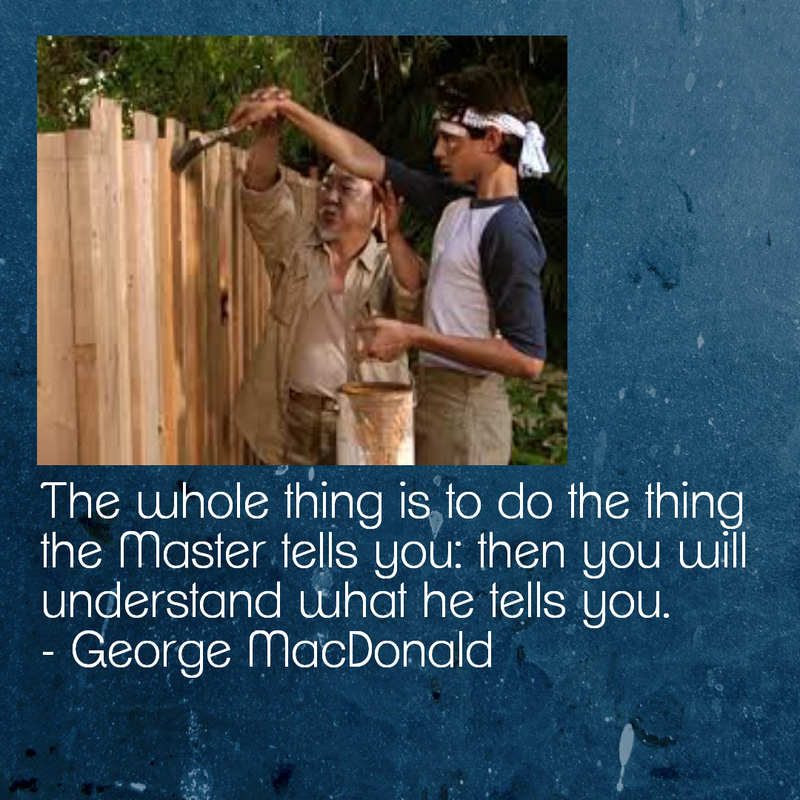 The Master told the student to wax the cars, and was specific how, paint the fence, sand the floor, and so on. Days of all these “chores” in the mind of Daniel was putting off his training to become an expert in karate. Tedious and mundane, hard, sweaty work, and days later irritation and confusion drive the student to challenge the Masters methods. Everyone in the audience had to pull their jaw up off the floor after the Master showed the student how each task had indeed trained without the mindset of fighting. It was brilliant! The student paid very close attention to do all that was asked of him from that point, realizing that even if it seemed irrelevant, he’d learn later, there is no such thing. It was a cunning and master stroke of writing – that movie. I know Who was behind it. The Master of all, Adonai, the creator of the Universe. This was the purpose of the movie, not the love story, though it was nice (clean, remember those days? ), not the picking on and fighting back of teenagers; but the contrast of two teachers and their students, their method and motive, how like mirrors the students of the bad teacher were, and yet unique, still individual Daniel was under the teaching hand of Miyagi. He taught through life, he taught through patience and peace, first to achieve those things in the student, then to practice it in karate. A true statement! Horizontally (man to man) this is exactly how we should be. Vertically (man to God) trust comes with much earned credit from God. It should be automatic from us, then He shows us, like Miyagi how the obeying of Him has armed us, humbled us, and transformed us into the people He created us to be when we were not yet a physical reality. His commands are written in the Word, but also given into our daily lives (should we ask and listen) thus His voice leads and guides us as it did Yeshua (Jesus) and we become like our Savior. Yet, Yeshua is Yeshua and we are who we are, I’m Lisa, not Yeshua, but like Him in that I listen to and obey the Father. My believing becoming more and deeper with each action taken upon hearing His instruction. Countlessly my jaw is dropped after doing what He said, and impatiently challenging His ways, He shows me what each task taught without me knowing what was being fortified in my muscle and memory with each obedience. Thus I have a living, breathing, relationship with the Master of the Universe! Like the wind, I never know from whence I came or where I’m going at the onset of doing as He says, but I always come away full of assurance that I’m in His will and being grown into something I couldn’t imagine on my best day I could be. His child! A living Word! His love poured out through me! Like Yeshua, but yet never exactly as His perfection in such obeying far exceeds the human reckoning. God doesn’t want a bunch of ‘saviors’, He sent One, and that was and is all that’s needed. He wants children, children to come home to the real Life that He made for them. What joy it brings to know my trust will never be ill placed in Him! Adventures follow the task of obeying! Jaw dropping moments, where my “floor sanding, fence painting, car washing” duties prove to be far more the object of the desired result than learning kicks and hits! May the Lord give you many jaw dropping moments as these last days unfold, and may our trust in Him become solid and steady with each leap to obey! Thanking and praising Him with each action, each word, each thought. Glory to God in the Highest! On point! I agree wholeheartedly. I fuss about my everyday “mundane” duties more than I care to admit, but I know God is at work and I trust in His unfailing love and plan for my life. Oh Pam, if only you knew how long you’ve been an example to me and many of these words! Miss you so!